Greig Laidlaw would be the first to emphasise that the job of Scotland rugby captain is nothing less than an honour and a privilege but that’s not to say it doesn’t come with a fair few crosses to bear. Professional sport is a results business and, while getting paid to play sport is the height of good fortune, it’s always a lot more fun when you’re winning. That is something Scotland simply haven’t been doing in the Six Nations and Laidlaw is clearly burning to put that right. The fact that the most recent defeats have, by and large, been close and contained a lot of good play by the men in dark blue, in a way, just adds to the torture. Laidlaw manfully faced the media once again yesterday and was first asked if he was heartily sick of answering the same questions about Scotland not quite getting the job done. It is easier said than done but Laidlaw knows that allowing the string of defeats to weigh on minds is a sure-fire road to more of the same as a vicious cycle takes grip. The Gloucester scrum-half continues to preach a positive outlook and views that as the only way to end the losing run which now stretches to nine games in the Six Nations. “We’ve got to play with confidence, 100 per cent,” he said. “I think we are playing with confidence, we’re playing well, we simply need to squeeze a little bit more out of each other to get over the line. Laidlaw knows that his own performance sets the tone and felt he stepped up well in Cardiff during that 27-23 defeat. Laidlaw had a couple of sniping runs in that first half at the Principality Stadium as Scotland carved out a 13-10 half-time lead and the skipper explained: “Tactically in the week, the way Wales defend, we wanted to slow them down and play in and around the rucks. We put an emphasis on that and it worked. “It was just lack of ball in the second half that stopped us from continuing that. Against England we never had the speed of ball to do that. I’d love to be able to do that the whole game, week in, week out, but if the ball slows up it’s just the scrum-half’s job to pass and look for space elsewhere. Scotland know Italy as well as any team at present, having come up against them three times in the past 12 months – following up the agonising 22-19 home loss in the Six Nations with two wins in World Cup warm-up Tests. 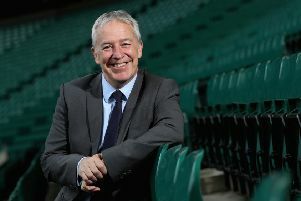 The second of those summer clashes was a thumping 48-7 victory at BT Murrayfield but Laidlaw knows the Italians will go into this game confident they can notch an eighth Six Nations win over the Scots.